If you are one of the many gardeners who have planted bamboo in your garden only to regret it later, then you have no doubt spent countless nights dreaming of many fantastic ways to kill bamboo. I was recently helping a friend of mine getting rid of some unwanted bamboo in his front garden and it is definitely not easy. 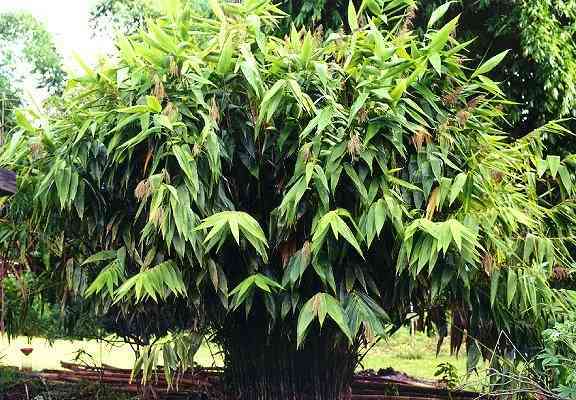 But although difficult to get rid of, bamboos are also very decorative, interesting, and useful plants. Bamboo is the fastest growing woody plant on Earth. There are more than 1000 species of bamboo and they are found in many different climates, from cold mountains to hot tropical regions. Bamboo is a group of woody perennial evergreen plants in the true grass family Poaceae, subfamily Bambusoideae. Some of its members are giant bamboo, forming by far the largest members of the grass family. Although some bamboos flower every year, most species flower infrequently. In fact, many bamboos only flower at intervals as long as 60 or 120 years. These bamboos exhibit mass flowering (or gregarious flowering), with all plants in the population flowering simultaneously. The lack of environmental impact on the time of flowering indicates the presence of some sort of �alarm clock� in each cell of the plant which signals the diversion of all energy to flower production instead of vegetative growth. This mechanism, as well as the evolutionary cause behind it, is still largely a mystery. After the mass flowering the adult plants will decline and often die entirely, leaving space and nutrition for the new plants. The death of the adult plants is due to resource exhaustion. When treated, bamboo forms a very hard wood which is both lightweight and exceptionally durable. In tropical climates it is used in elements of house construction, as well as for fences, bridges, walking sticks, canoes, tableware, furniture, chopsticks, toys, bicycles, construction scaffolding, martial arts weaponry, etc. The shoots (new bamboo culms that come out of the ground) are edible. They are used in numerous Asian dishes and broths, and are available in supermarkets in various sliced forms, both fresh and canned version. Bamboo shoots are usually cooked before eating as some may contain cyanogens. Properly prepared bamboo shoots are a safe, tasty and exotic addition to the table. Most of us have tried bamboo in Chinese dishes and lumpia rolls. The empty hollow in the stalks of larger bamboo is often used to cook food in many Asian cultures. Soups are boiled and rice is cooked in the hollows of fresh stalks of bamboo directly over a flame. Cooking food in bamboo is said to give the food a subtle, but distinctive taste. Taking care of bamboo is easy It often seems to be doing well enough without care so anything you add will be an improvement. Some bamboos are best placed in full sun, while others prefer light shade. For optimal conditions they should be given ample water, fertilizer, and protection from competitive weeds. 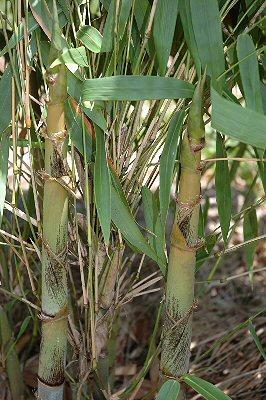 Once a bamboo has reached the desired size, it can survive with much less irrigation. Most bamboos are happiest in a moderately acidic loamy soil. If your soil is very heavy you can add organic material, and leave the fallen bamboo leaves under the plant, as they keep the soil soft, moist, and recycle silica and other natural chemicals necessary to the bamboo. Many bamboos are popular in cultivation as garden trees or privacy hedges. 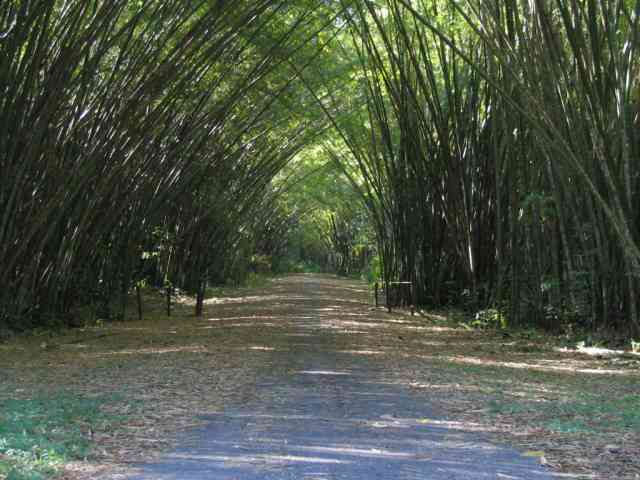 In general, bamboos can be divided into �Runners� and �Clumpers�. The clumpers do not invade. Clumping bamboo species tend to spread slowly, as the growth pattern of the rhizomes (underground root balls) is to simply expand the root mass gradually, similar to ornamental grasses. To remove a clumper, just dig it out. Runners can be well-behaved in cold climates, but some kinds, when in a warm climate, can become a serious problem. They spread mainly through their roots and/or rhizomes which can spread widely and quickly underground and send up new culms (shoots) to break through the surface. Do not plant a runner in a garden in a warm climate, unless you put a barrier around it! A barrier two or three feet deep is effective. It should be slanted outward at the top and project an inch or two above ground level. Barriers can be concrete, metal, or plastic. Check the barriers once or twice a year, and cut off any rhizomes that arch over the top. Bamboo is usually propagated by digging up part of a clump of existing bamboo and moving it elsewhere. Transplanting is hard work and involves digging a large chunk of root ball out of the ground. Never transplant bamboo when it is shooting. Dig bamboo either very early in the spring, before there is any chance of shooting, or wait for the growth period to be over in the late autumn. You should look for a clump of culms (stalks) that has come up in the last year or so and which includes at least three or four healthy-looking culms. Bamboo rhizomes are tough, so you may have to use a sharp shovel, axe or saw to separate the clump from the rest of the grove. If you will be transporting the division, then water the leaves and roots well, wrap the whole thing in plastic and get it into the ground as quickly as possible. 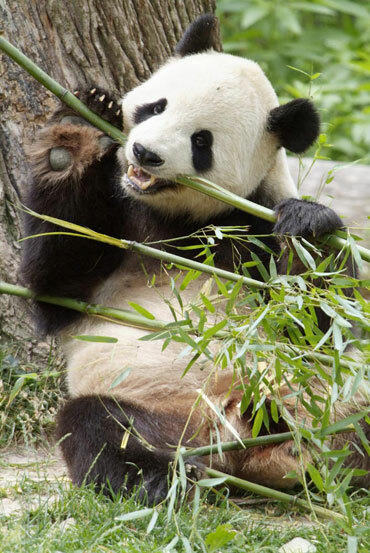 Someone suggested renting a panda bear as they feed on bamboo - the problem though, is that they do not eat the roots. All of the culms of bamboo in a clump or grove are interconnected underground by rhizomes. A bamboo grove is usually one single plant, not a group of plants. Many people have the impression that every bamboo culm is a separate �tree.� Once established as a grove, it is difficult to completely remove bamboo without digging up the entire network of underground rhizomes. My friend�s bamboo grove was contained by concrete barriers and only about 5-6m2 big so we decided to dig them out. But even with the two of us it was very hard work. We are now waiting to see if we got it all or if any new shoots will appear. If so, it should be relatively simple to remove the last few remaining rhizomes. With larger groves you will probably need an excavator or similar. Instead of digging out the rhizomes, some people prefer to kill the bamboo with poison, by exhaustion, deprivation of sunlight, or a combination of all. Killing bamboo, however, is a long and tedious battle as new shoots usually keep popping up. So, digging or killing? What is easier all depends on what plans you have for the area afterwards. If you want to put concrete, tiles, or gravel, the killing method is fine, but if you want to plant something else you will still need to dig the rhizomes out of the ground. No matter which method you choose, you first need to cut down the bamboo and throw away the culms. Getting rid of bamboo is hard work. Good luck and may the force be with you! Plant clumping varieties of bamboo, not running types. Clumping bamboo is much easier to control. Even the smallest piece of rhizome will grow if given the slightest opportunity. 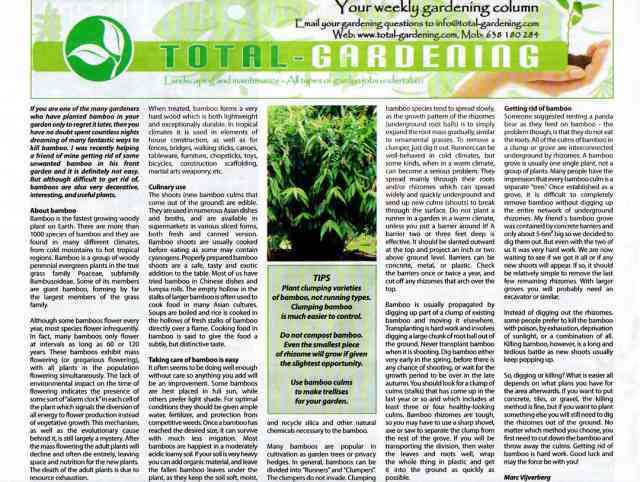 Use bamboo culms to make trellises for your garden.